Lamarck, abortion, Expelled and Ben Stein and more! An Uncommon Descent into Lamackism - Devolution of evolutionary theories. Using abortion as an art medium - This project should have been aborted long ago. Editor’s Choice: Expelled: No Intelligence Allowed! (Part 2) - The gift that keeps on giving. In promoting the creationist propaganda film Expelled, Ben Stein managed to stick his foot in his mouth over and over again, issuing what seemed to be a ceaseless stream of ignorant, offensive, and just plain daffy claims. Here’s your chance to set Ben straight. Send your favorite claim to setbenstraight@ncseweb.org along with a refutation. We’ll post the best for all the world to see. And five lucky entrants will receive a year’s subscription to Reports of the NCSE along with their choice of a book from NCSE’s shelf — including such useful books as Mark Isaak’s The Counter-Creationism Handbook, Eugenie C. Scott’s Evolution vs. Creationism, and the AAAS’s The Evolution Dialogues: Science, Christianity, and the Quest for Understanding. But you only have ten days, and a wealth of silliness to examine, so act now! Follow the link to the rules. This might be fun for someone here and a chance to do SFN proud!!! to get me into trouble. Sunday: Our chat host may be returning to work on May 4th! Wednesday: Ricky was absent. We had a pretty long discussion about Cuneiform because we sometimes have to let Cuneiformist show off his PhD. We talked about Semites and Sumerians and deciphering the languages of those long ago times. If I hadn’t been sick, and drawn extra and unexpected duty, I might remember other things about last week’s chat. It must have been a good one because it lasted for two-and-a-half hours… That’s how I figure it. 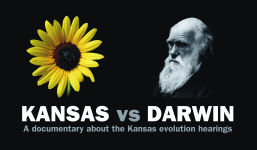 Kansas vs. Darwin, directed by Jeff Tamblyn. There were 9,768 daily visitors this week.